The young Germans WARFIELD unleash their first full-length upon the world. Brutal, uncompromising and honest old school thrash metal is what they serve. The trio manages to deliver with ease what many veterans seem to have forgotten. Each song rages and rampages with screaming guitars, thundering drums and overpowering roars, but never forgets to sound authentic. The self-proclaimed Teutonic thrash image nods to early icons like KREATOR, DESTRUCTION and especially the war-themed SODOM creations. But fans of thrash from across the pond won't be disappointed either, as bands like SLAYER, EXODUS and RAZOR definitely left their mark on this album as well. A minimalist low-key production gives the songs a raw finish, promoting the unstoppable energy oozing from the speakers. The uncommon choose to abstain from the click gives the recording an organic and dynamic vibe which is missing in the most modern music. A fine first timer straight from the aggressive young thrashing heart! The first band formation took place with the introduction of bassist Frederik Pütz in early 2012, after Johannes Clemens (15, vocals), Matthias Clemens (18, guitar) and Dominik Marx (15, drums) had already played together a couple of years. It wasn't that difficult to find a style of playing when you have some of the biggest Thrash Metal Titans in your own country. The speed, the aggression and the anger mesmerized the band from day one, and so they decided to represent their music in that fast and direct way. 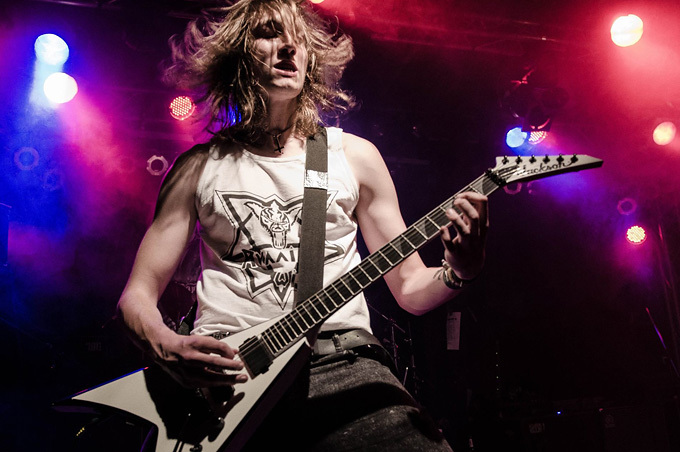 After a few shows, including the gig at Metallergrillen Open Air 2013, Dominic Potts joined the band in fall of 2013 to occupy the second guitar position. In spring of 2014 the work for the debut EP "Call to War" had begun, which was released in October of 2014 via IMM-Records/Membran. Shortly thereafter, Frederik Pütz had to leave the band and was replaced by Ethan Stokes at the beginning of 2015. With him the band put out the single "Barrage Fire" and also shot a video clip, which was published on YouTube on 28-08-2015. At the end of 2015, Dominic Potts and Ethan Stokes both left the band due to time issues. Since then, Marc Hirschbach has handled the 4 strings as a session/live member. 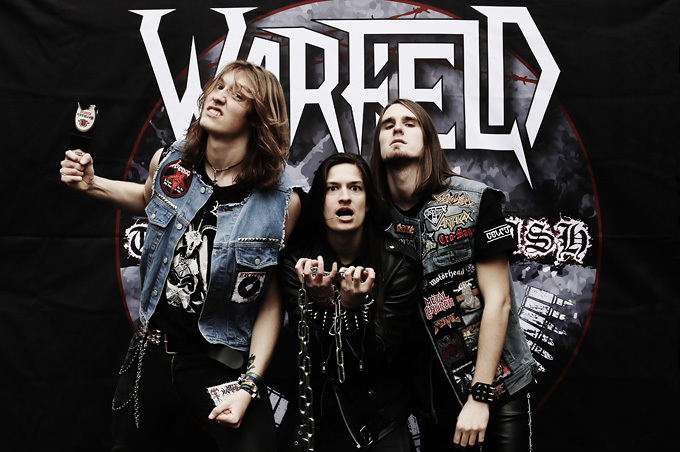 After they played a lot of club shows all over Germany, in 2016 WARFIELD were booked for different metal nights and festival shows. So they began playing gigs near Switzerland; at the Taunus Metal Meeting with underground idols like KETZER, WARRANT, IRON KOBRA and EVIL INVADERS; the Bonebreaker Festival with DEW-SCENTED and DUST-BOLT; not to forget the Pälzer Hell Festival, a "hometown" event together with SCHIRENC PLAYS PUNGENT STENCH. In this cast, they put focus on the release of their debut album "Wrecking Command". Over the years a lot of songs were written, some new stuff was completed and finally 10 skull-breaking songs were recorded in Kaiserslautern from February till March 2017. With "Martyr", "Call to War" and "Under the Surface", the album includes three songs which are also found on the EP, only now they have an even more aggressive and powerful sound. In the meantime, the band played alongside STEELWING at their farewell gig and got an offer to tour the Czech Republic together with the punk thrashers from INSANITY ALERT. From the 6th till 10th of June 2017 WARFIELD were touring through the Czech Republic and took the chance to get more attention from foreign countries. A similar tour will be repeated in October of 2018, when they will support the Greek thrashers from BIO-CANCER all over Eastern Europe. During the festival season in 2017 they returned to the Metallergrillen Open Air once again and thrashed the stage together with alcoholic metal legends TANKARD. In 2018 things started moving fast and just when they wereabout to self-release the CD, the band got a last-minute offer from Metal on Metal Records to publish and promote the album. 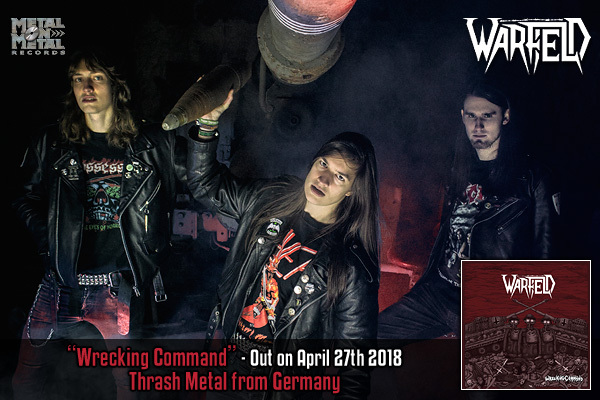 "Wrecking Command" finally will be released via Metal on Metal Records on April 27th 2018 at the Keep It True festival. This relentless thrashing won't let you catch a breath... so thrash (along) or be thrashed!